Thessaly or Thessalia (Attic Greek: Θεσσαλία, Thessalía or Θετταλία, Thettalía) was one of the traditional regions of Ancient Greece. During the Mycenaean period, Thessaly was known as Aeolia, a name that continued to be used for one of the major tribes of Greece, the Aeolians, and their dialect of Greek, Aeolic. At its greatest extent, ancient Thessaly was a wide area stretching from Mount Olympus to the north to the Spercheios Valley to the south. Thessaly is a geographically diverse region, consisting of broad central plains surrounded by mountains. The plains are bounded by the Pindos Mountains to the west, Mount Othrys to the south, the Pelion and Ossa ranges to the east, and Mount Olympos to the North. The central plains consist of two basins, the Larisa basin and the Karditsa basin, drained by the Pineios River into the Vale of Tempe. The Pagasetic Gulf in southeastern Thessaly was and is the only body of water suitable for harbours in region. 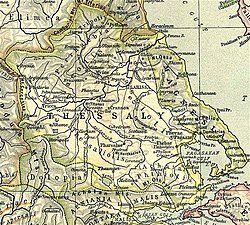 Strictly speaking, Thessaly refers primarily to the central plains inhabited by the Thessalians in antiquity. The plains were divided in antiquity into four administrative regions called tetrads: Pelasgiotis, Phthiotis, Thessaliotis, and Histiaeotis. In its broader sense, Thessaly also included the surrounding regions called the perioikoi, which were regions inhabited by different ethnic groups that were closely tied to the Thessalians either as subordinates, dependents, or allies. The perioikoi were composed of Perrhaibia, Magnesia, Achaea Phthiotis, Dolopia, Ainis, Malis, and Oitaia. The three largest cities in Thessaly were Larisa (Pelasgiotis), Pherai (Pelasgiotis), and Pharsalos (Phthiotis). The Thessalian plains were ideally suited for cultivating grains and cereals, and were known in antiquity for horse-rearing. Alexander the Great's horse, Bucephalus, was originally from Pharsalos. The surrounding mountainous regions, however, were less suitable for agriculture and relied more heavily on pastoralism. Thessaly was home to extensive Neolithic and Chalcolithic cultures around 6000 BC–2500 BC (see Cardium Pottery, Dimini and Sesklo). Mycenaean settlements have also been discovered in Thessaly unearthing, at the Kastron of Palaia Hill, in Volos, tablets bearing Mycenaean Greek inscriptions, written in Linear B. In mythology, Thessaly was homeland of the heroes Achilles and Jason, as well of mythological creatures and peoples, Centaurs, Lapiths, Phlegyans and Myrmidons. Ancient tribes in Thessaly mentioned by Homer or other poets were: Aeolians, Magnetes, Perrhaebi and Pelasgians. The name of Thessaly recorded epigraphically in Aeolic variants *Πετταλία, Πετθαλία, Φετταλία, Θετταλία. The Penestae, whose condition was nearly the same as that of the Helots. The subject people, who inhabited the districts not occupied by the Thessalian invaders. They paid tribute, as stated above, but were personally free, though they had no share in the government. They corresponded to the Perioeci of Laconia, by which name they are called by Xenophon. The Thessalian conquerors, who alone had any share in the public administration, and whose lands were cultivated by the Penestae. For some time after the conquest, Thessaly seems to have been governed by kings of the race of Heracleidae, who may however have been only the heads of the great aristocratic families, invested with the supreme power for a certain time. Under one of these princes, named Aleuas, the country was divided into four districts – Phthiotis, Plistiaeotis, Thessaliotis and Pelasgiotis: This division continued throughout Thessalian history, and it may therefore be concluded that it was not merely a nominal one. Each district may have regulated its affairs by some kind of provincial council, but we are almost entirely in the dark concerning the internal government of each district. When occasion required, a chief magistrate was elected under the name of tagus, whose commands were obeyed by all four districts. He is sometimes called king (basileus, Herod, v. 63), and sometimes archon (Dionys. v. 74.) He levied soldiers from the states in each district, and seems to have fixed the amount of tribute to be paid by the allies. (Xenoph. Hell. vi. 1. § 19.) When Jason of Pherae was tagus, he had an army of more than 8,000 cavalry and not less than 20,000 hoplites (Xenoph../. c.), and Jason himself says that when Thessaly is under a tagus, there is an army of 6,000 cavalry and 10,000 hoplites. The tribute Jason levied from the subject towns was the same as had been previously paid by one of the Scopadae family, whom Buttmann supposes to be the same Scopas as the one mentioned by Aelian ( V. H. xii. 1) as a contemporary of Cyrus the younger. When Thessaly was not united under the government of a tagus, the subject towns possessed more independence. (Xenoph. Hell. vi. 1. § 9.) In later times, some states called their ordinary magistrates tagoi (Bockh, Corp. Liscr. n. 1770), which may have been done however, as Hermann suggests, only out of affectation. However, the power of the aristocratical families seems to have continued with little diminution until towards the close of the Peloponnesian War, when decidedly democratic movements first begin to appear. At this time, the Aleuadae and the Scopadae had lost much of their ancient influence. Pherae and Pharsalus then became the two leading states in Thessaly. At Pherae, a tyranny, probably arising from a democracy, was established by Lycophron, who opposed the great aristocratical families and aimed at the dominion of all Thessaly. (Xenoph. Hell. ii. 3. § 4 ; ^Diod. xiv. 82.) The latter object was accomplished by Jason of Pherae, the successor, and probably the son, of Lycophron, who effected an alliance with Polydamas of Pharsalus and caused himself to be elected tagus about in 374 BC. While he lived, the whole of Thessaly was united as one political power but, after his murder in 370 BC, his family was torn asunder by internecine discords and did not maintain its dominion for long. The office of tagus became a tyranny under his successors, Polydorus, Polyphron, Alexander, Tisiphonus, and Lycophron; until, at length, the old aristocratical families called in the assistance of Philip II of Macedon, who deprived Lycophron of his power in 353 BC, and restored the ancient government in the different towns. At Pherae, he is said to have restored popular, or at least republican, government.(Diod. xvi. 38.) The Thessalian people elected Philip archon tagus of the Thessalian League for life; a few years later (344 BC), he re-established the tetrarchies (or tetradarchie), installing governors devoted to his interests and who were probably members of the ancient noble families. (Demosthen. Philip, ii. p. 71, iii. p. 117; Harpocrat. s. v.). The Thessalian cavalry became also part of the Macedonian army and many Thessalians took part in the campaign of Alexander the Great. At the close of the First Macedonian War, 197 BC, under Flamininus, it was declared free along with Orestis; but ultimately it was incorporated in the Roman province of Macedonia along with Epirus vetus. ^ a b Derived from tessares/pettares "four", from a division into four parts (Thessalian tetrarchy; Phthiotis, Thessaliotis, Histiaeotis and Pelasgiotis), according to G. N. Khatzidaki, "Koskylmatia", Athena 8 (1896), p. 119 εκ του πέτταρες ( = τέτταρες, δια την εις τετράδας διαίρεσιν της χώρας, ἤτοι εις Θεσσαλιώτιδα, Φθιώτιδα, Πελασγιώτιδα και Ἱστιαιώτιδα). Daniēl Magnēs, Lexikon historikomythikon kai geōgraphikon (1834), 161f..
^ Smith, William (1870). "TAGUS". In Smith, William. Dictionary of Greek and Roman Antiquities (2nd ed.). London: James Walton. pp. 1093–1094. TAGUS (Τάγου), a leader or general, was more especially the name of the military leader of the Thessalians. Under this head it is proposed to give a short account of the Thessalian constitution. ^ Thucyd. ii. 101, iv. 78, viii. 3,; Aristot. Pol. ii. 6. ^ Hell. vi. 1. § 19. ^ Aristot. ap. Harpocrat. s. v. Tetrarchy: Strab. ix. p. 430. ^ Thirlwall, Hist, of Greece, vol. i. p. 437. ^ Liv. xxxiii. 34, xxxiv. 51, Polyb. xviii. 30. This article incorporates text from a publication now in the public domain: Smith, William, ed. (1870). "TAGUS". Dictionary of Greek and Roman Antiquities. London: James Walton. pp. 1093–1094.